Soon, we'll have Math 3.0 - and we'll still be figuring out Math 2.0. 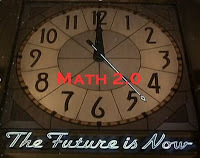 I see Math + Web 2.0 as utilizing Web 2.0 to increase math skills, math knowledge, and math understanding. Students can create, collaborate, and communicate...about math.